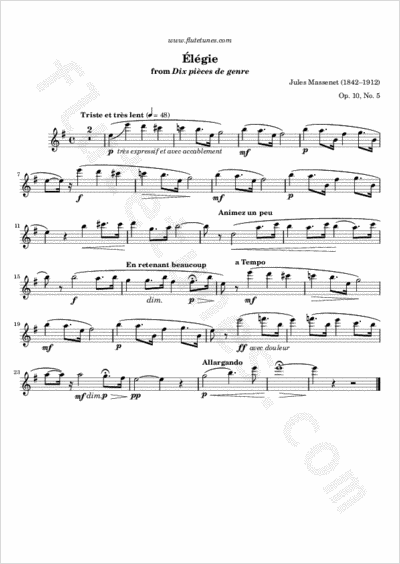 This piece was perhaps one of the most popular melodies in Europe of the fin de siècle, the last decades of the nineteenth century, often referred to as the Belle Epoque (literally, “Beautiful Era”). Massenet originally composed “Élégie” in 1866 for a piano cycle titled Dix pièces de genre. In 1872, he incorporated the piece into Les Erinnyes (The Furies), a play by Leconte de Lisle. “Elégie” gained even greater renown as a song for voice and piano, set to a poem by Louis Gallet, with the title “O doux printemps d'autrefois” (“O sweet spring of days long ago“).